Are you a true believer of “hold the drink”? If yes, these long glass tumblers are the coolest way to do that. Whether you’re raising a toast to yourself or celebrating a friend, the glasses are perfect for some cheery vibes. Own a set of 2 for INR 899. Calling Beer Geeks! There is no claiming you’re a beer master till you own a Beer Growler. The Bira 91 special is made of amber glass with a reusable plastic seal, so you can carry upto 1.5 litres of the favourite brew over to your friends for that match or movie night. Available for INR 999. Proudly proclaim your Bira 91 love with these super-comfy cotton tees that are perfect for those chill times. Pick your style and pair them right with your favourite jeans. They have a limited section as well, where you can check out all the new trends, they have something new every season. Own these at INR 799 per piece. 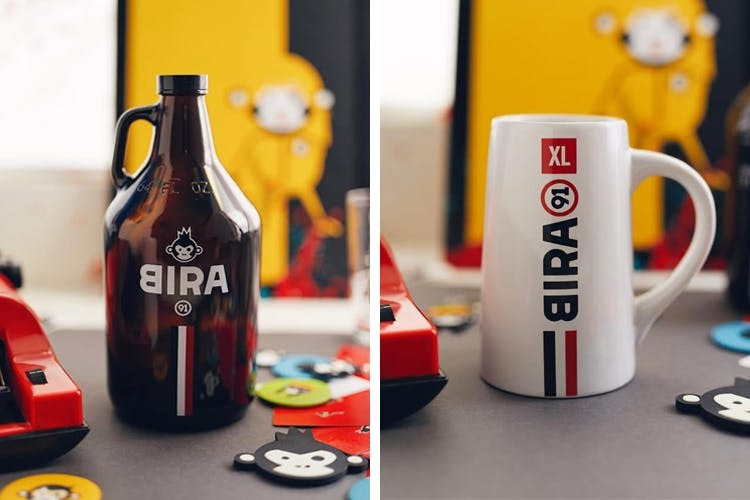 These make up for ultimate collectibles for all Bira 91 fans—keychains, stickers, fridge magnets, coasters, notebooks, postcards and so much more! Check out their Hollywood inspired framed art posters to quirk up the wall. If you’re nerdy about having it all, get it here. They are all available in assorted packs. Treating yourself or someone else? Bira 91's online shop is here to sort all your gifting woes. Check out all of the above and get ready to take the beery world by storm. Grab them right away before the stock runs out.